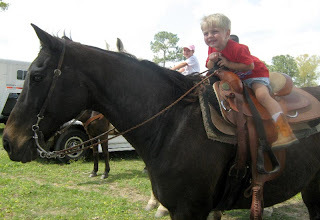 This past Saturday we loaded up the kids and horses and went to the High Hope Rodeo Playday. It was a practice rodeo before the "real" rodeo started. Big Cowpoke was so very excited. 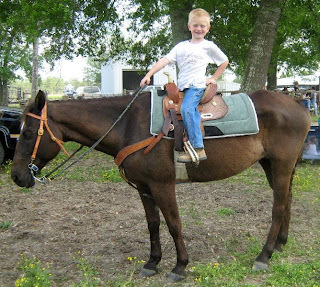 He rode his new horse, Daisy, everyday that week in preparation for the rodeo. We almost didn't get to go to the rodeo. We thought we would have had to go to Fort Worth, Texas to take Pearl to go and meet her boyfriend. But Pearl was not quite ready to go and see her boyfriend, so, we were able to go to the playday rodeo. When we got there we unloaded the horses and started to tack them up. The High Hope Rodeo is very family oriented. It is run by the Martin Family. They have 6 children who are all grown and married with about 5 kids to each new family. There are kids and babies everywhere. We love it. 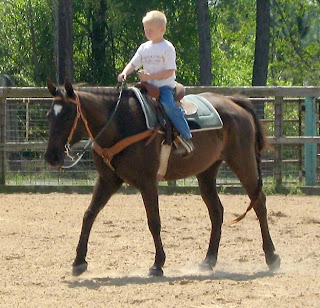 The Martin Family is known mostly for their kids roping. 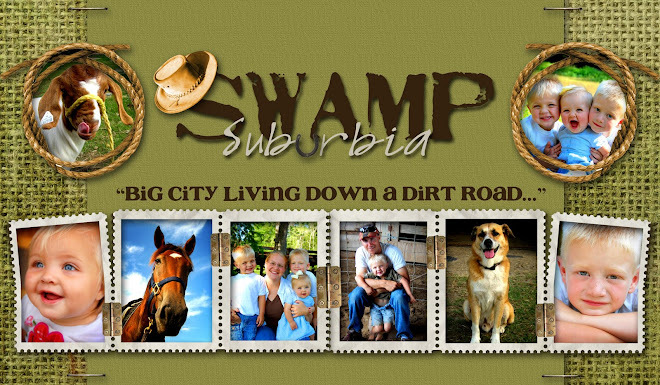 You should see their cute little 6 and 7 year old kids riding horses and roping calves. It's really cute. Well, any way. Big Cowpoke's horse was supposedly a roping horse. That is what the man told us when we bought her. The man also told us she was 16 years old and she ended up being around 21! 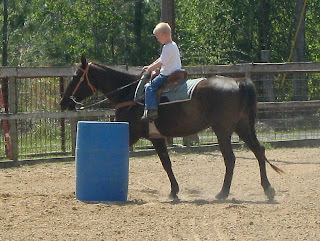 So, we asked one of the Martin grown up kids to try and do break away roping on Daisy. He said he would. So, we tacked her up and he jumped on her and into the roping box they went. And off she went. 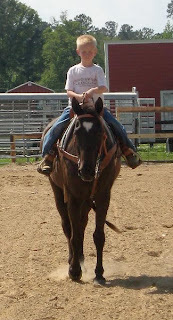 Now as you can see she is a bit far behind the calf for the rider to be able to rope it. 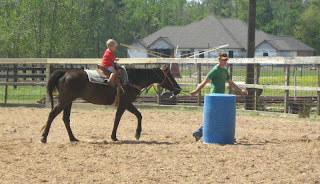 We discovered that she was not at all scared of the whole roping thing, or chasing the calf thing, or the noisy shoots. But that was it, she was a bit too dull. Not quite fast enough. But she was good and she tried. And we came to the conclusion that she really had no idea what to do with the calf. But that is okay. Big Cowpoke doesn't ride faster than a walk so there will be no calf roping in the near future. 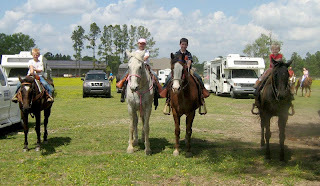 As soon as the kids were all ready to ride they all got on their horses and watched all the faster bigger kids ride. Here is Big Cowpoke looking worried while watching the big kids fly around the barrels. Big Cowpoke kept saying, "Look mom they are all going so fast and they will want me to go that fast and I don't want to go that fast and I am not going to do it." But I reassured him he could go as slow as he wanted. Here is Big Cowpoke and his horse Daisy. I mean come on, does she look like she could go fast? I think she is even sleeping in this picture. Here is Little Cowpoke. 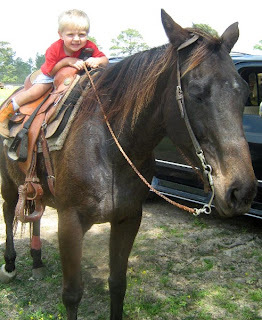 He was so brave to ride Pearl after his whole falling off incident. He really loves to ride. Little Cowpoke was ready to go fast. He was so excited about it being his turn. I think Pearl has a different plan. She is taking a small nap. Here are all the cowboys and cowgirl. The two in the middle are my cowpoke's cousins. Those two horses were buddies and they didn't want anyone near them. So, we had the other two stand a bit farther away!! 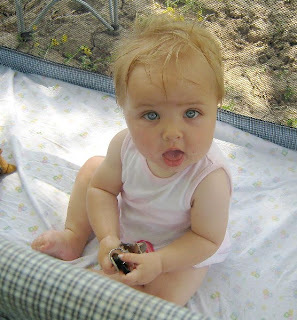 Here is my angel. Cowpokette, hung out all day in her playpen. She loved it. Then it was time for Big Cowpoke to take on the clover leaf barrels. And they were off. I think this was the fastest walk I saw Daisy do all day. Which it wasn't very fast. Then came some barrels. Here they are turning around the second barrel. And now here they are "running" home. I would yell, "Trot, come on you can do it!! 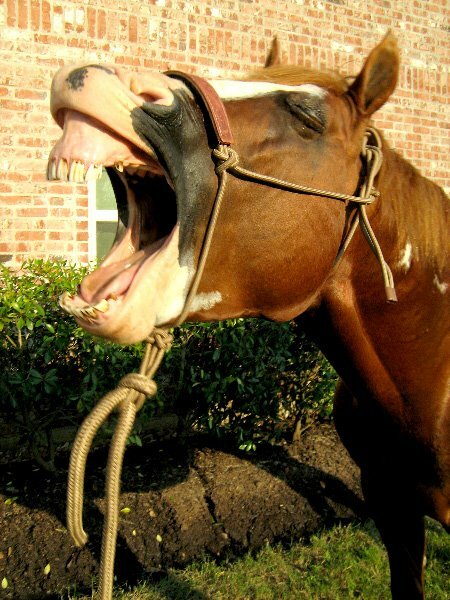 Trot!!" Big Cowpoke just moved his head back and forth and kept on walking. His time was 1 minute and 34 seconds. A normal barrel run in this arena is about 18 seconds. Way to go Big Cowpoke. Here Little Cowpoke had his turn at the barrels. He isn't old enough to turn all by himself so Mr. Cowboy lead him through the pattern. You can see how slow Daisy walks here. Little Cowpokes time was 1 minute 20 seconds. We need to get Big Cowpoke to trot just a little bit!! Then it was my turn. I have never run the barrel pattern at a rodeo before. 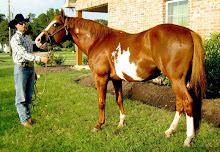 I have always ridden English or Western Pleasure. So, the thought of going that fast and turning that fast kinda scares me. But I gave it a try on my old trusty horse Pearl. I love that girl!! 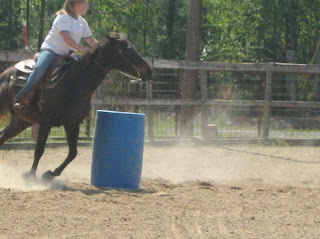 Here I am rounding the second barrel. I think I need to give some more with my right hand! You see how wonderful that picture is? Mr. Cowboy was taking pictures of me. And here we are rounding the third barrel and running home. Again, Mr. Cowboy took this picture. We were going kinda fast! See the dust flying? We had a time of 29 seconds. I am a scardy cat. 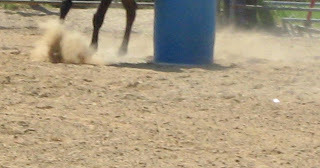 I just did a slow canter around the barrels. But now for the final run. Mr. 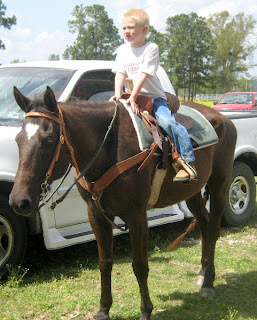 Cowboy rode our 12 hand pony Buttercup. I have been riding her for about two weeks getting her ready for the playday. I do all the dirty work at home and then Mr. Cowboy gets on and rides the hair off the horse and takes all the credit for the run. But that is okay. I let him. It makes him feel good. But that is about it for now. I have lots more pictures but I won't bore you with them. Oh, and just to let you all know, Mr. Cowboy messed up Buttercup on the third barrel. That was all the rider's fault!! I think their time was 22. Which I think is darn good for a 12 hand pony. A big horse will run that pattern in an 18. We will get Buttercup to take off a few seconds!! Just give me some time! But that is all for now, y'all come back now ya hear! It looks like y'all had a lot of fun! Little Cowpoke is so brave. Andrea- I sure do wish you were closer to teach me further in my horsemanship. Tell your cowboy to work on his photomanship :) I would love to see more of you riding. Too bad we aren't closer. I'd teach you to barrel race and you could give me pointers on jumping and dressage (I used to jump but haven't had a horse for it in years)! Looks like so much fun! I can't believe all that blonde hair on Little Cowpokette!!! I love those pictures of you riding.